Did another quick check on the transmission and front diff. 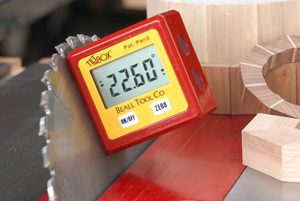 flange angles, this time with my little “Beall Tilt Box” electronic angle finder. Accounting for the the angle the van was sitting at (approx. 0.25 degrees) I measure a downward angle at the transmission flange of 4.90 degrees and at the front diff. flange I measured a downward angle of 2.50 degrees. This is pretty close to the quick laser measurement (and subsequent trig calc. ) of 2.45 degrees and 4.45 degrees I did yesterday. Time now to measure it with more care, using both methods, and then to see if I can adjust either the transmission or the front diff. angles so that they are the same. God this blog must seem like the most boring place on earth… what an anorak I am turning into. I have to reiterate, this was a quick test, approximate measurements only. I attached my laser alignment jig to, in turn, the transmission output flange, then the front diff. 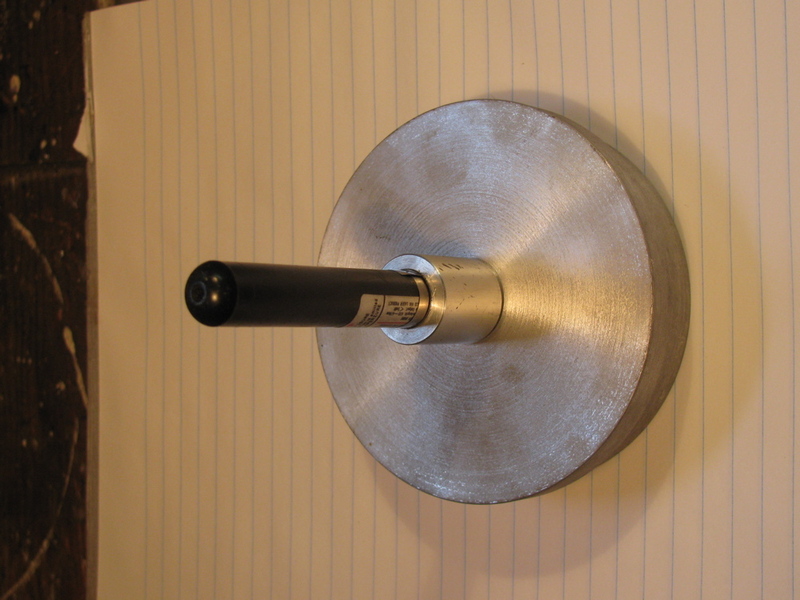 input flange. 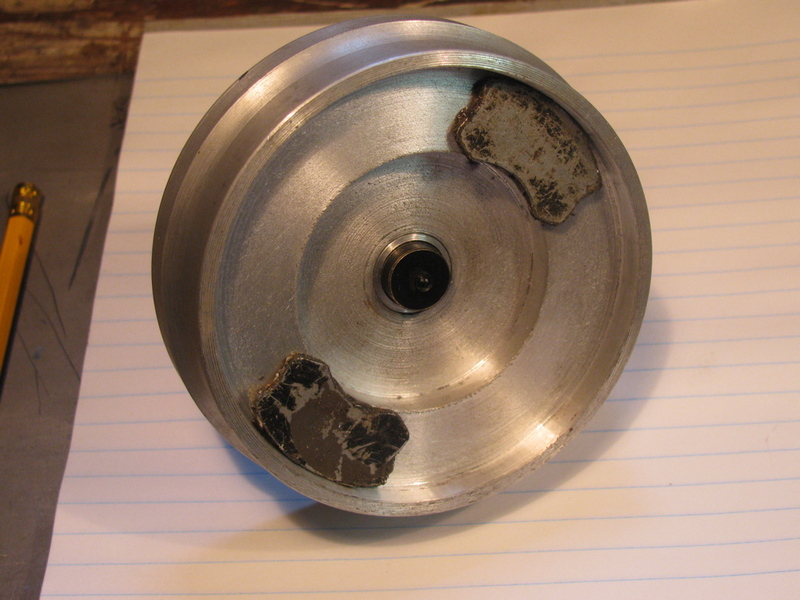 Each time I measured down from the centre of the opposite flange to where the laser dot was. I also measured the distance between the centres of both flanges. I did not measure any lateral alignment this go round. What I found was the front diff was pointing down at a lesser angle then the rear transmission, 2.45 degrees vs 4.45 degrees. Ideally the angles should be equal and less than 4 degrees (but not zero degrees). If you slept through trig, what you need to know is the TOA part of SOHCAHTOA. TOA means tangent = opposite over adjacent. 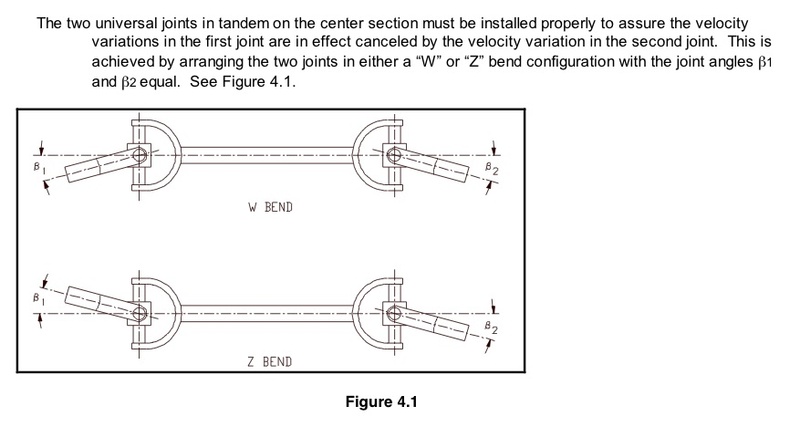 For example in diagram above, for transmission flange, the tangent of the angle is 100/1285 -> 4.45 degrees. Just do the 100/1285 bit on your calculator then hit the tan-1 button. You can see how my syncro is in the “W” bend form, but the 2 angles are not equal. The angles must be equal, or damn close, to eliminate vibrations. This means I have to adjust the angle that the front diff. sits by shimming the front mount. 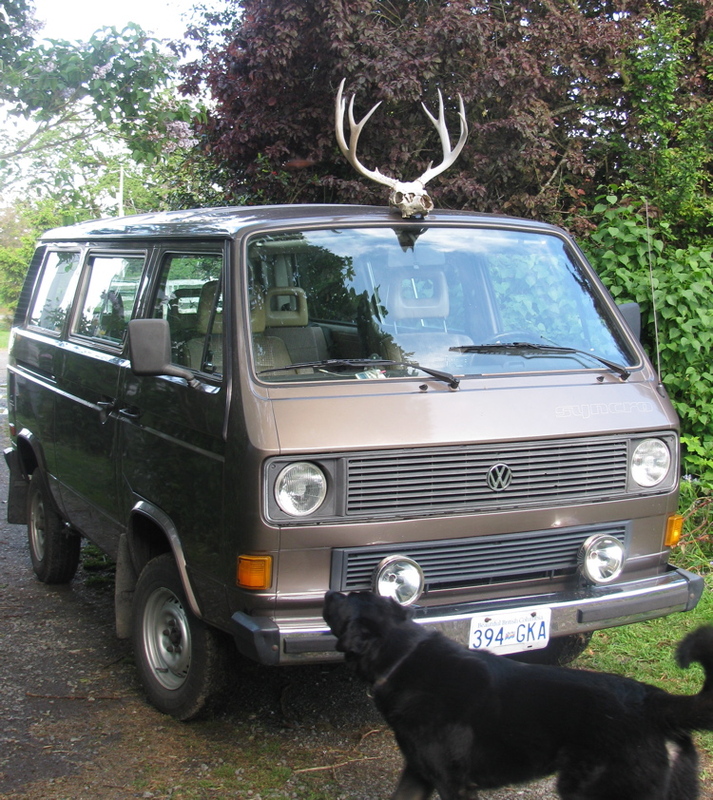 German article from Automobiletechnische Zetischrift introducing the Vanagon syncro. 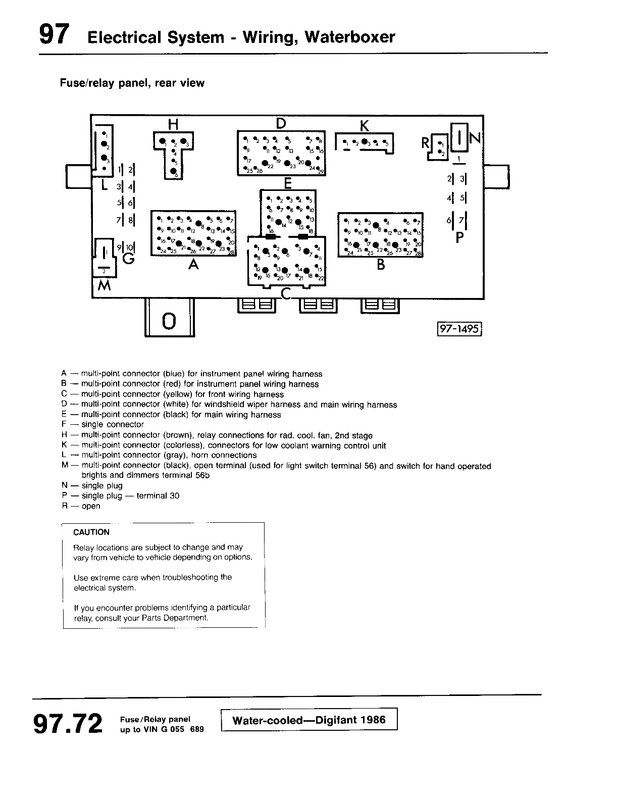 Technical details etc., pdf 860 KB. Mark II of my laser alignment tool for driveshaft, more to come if I get off my duff and make a registering strip to show where laser dot lands. Inspired by Herman’s work (see blog role, Herman’s Syncro Project). Headlight on warning chime mod. Just for a lark, I thought I’d try and repurpose the seatbelt/key in ignition warning chime to make it work as “lights left on’ chime. 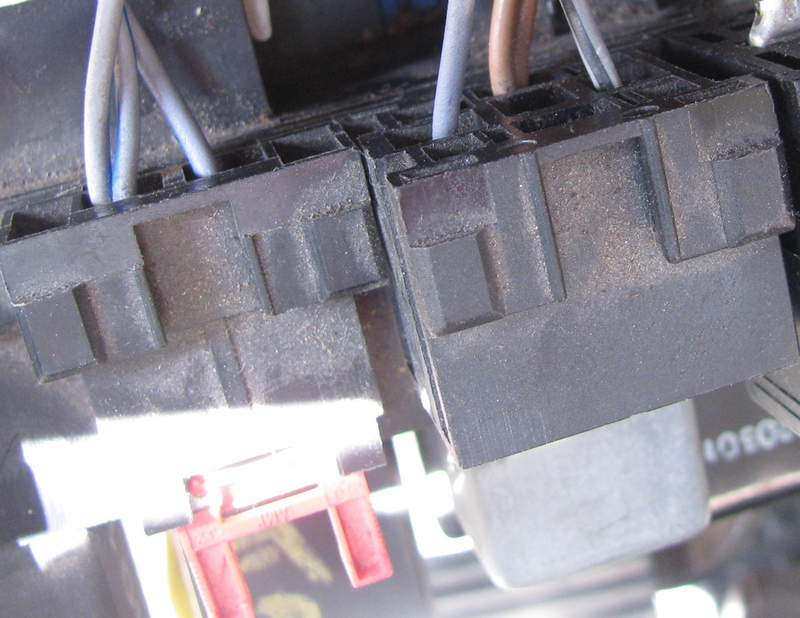 -relay socket on top of fuse panel), has some wires to it, but not all. Missing black wire from fuse S18. only one grey wire from door switch the missing grey is for seat belt switch. Missing grey/red wire that is also part of seat belt switch. So I thought I would use that incomplete socket to make a “lights left on chime” circuit. Turn out it is easier just to take another socket and slip it onto the relay panel, less fussing with pulling wires out of the relay socket, which is a bit of a pain. Anyway, this is what I did… I had a 99 chiming relay, the “do-do-do, do-do-do” annoying tune, a spare socket, and a short length of 14 gauge wire with female spade connectors at each end. I pulled the single grey wire from the incomplete seatbelt/key in ign socket (those of you with two wires there, you will have to cut the right wire, the one that leads to door switch, and put on a new female spade on) and this will connect to 86 on the chiming relay. 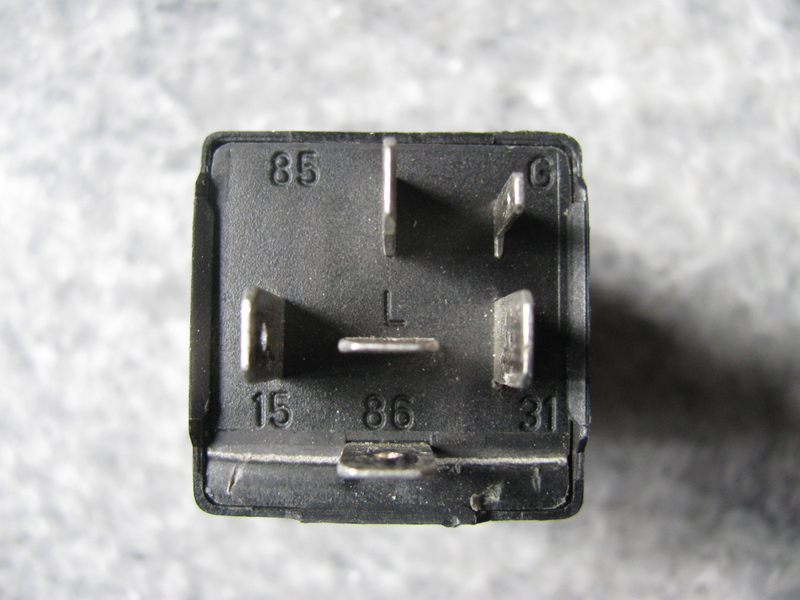 See how the relay fits in the socket so you can get the spade connection into the right hole so it will connect with 86. 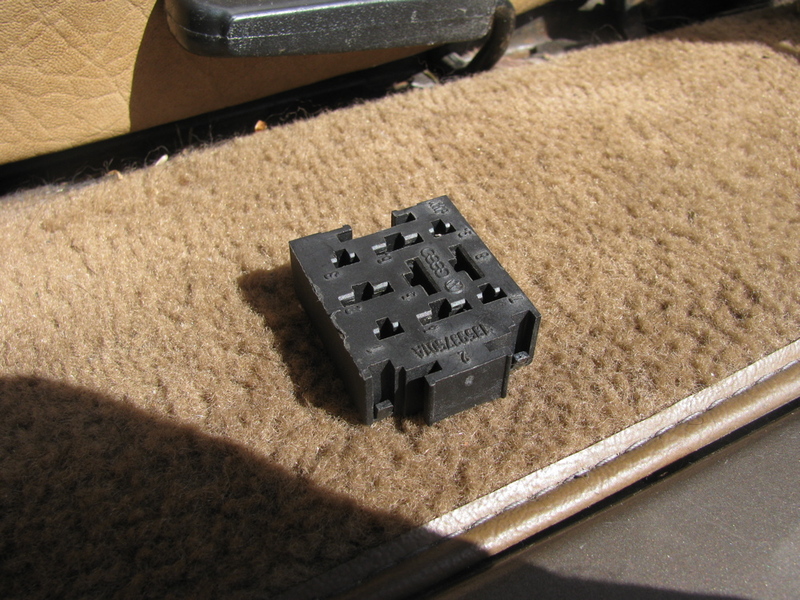 This is the switched ground, grey wire will connect to ground when door open, drivers door only. Now we need power to the 85 terminal of relay. But we only want power when lights are on, right? I choose terminal G9 on back of relay panel. 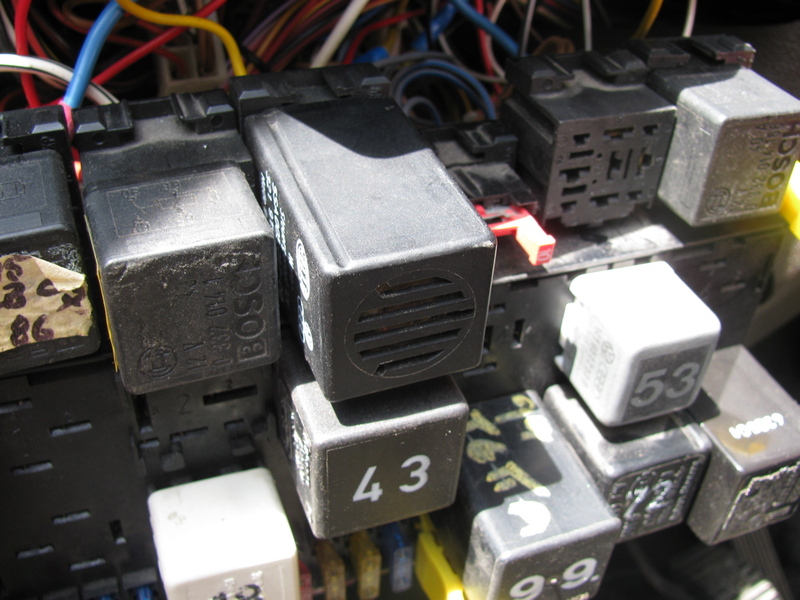 Its on the right hand side as you look at the panel, a group of 10 spade terminals. G9 gets power when license plate lights get power, so it will supply power to chiming relay when light switch is on. 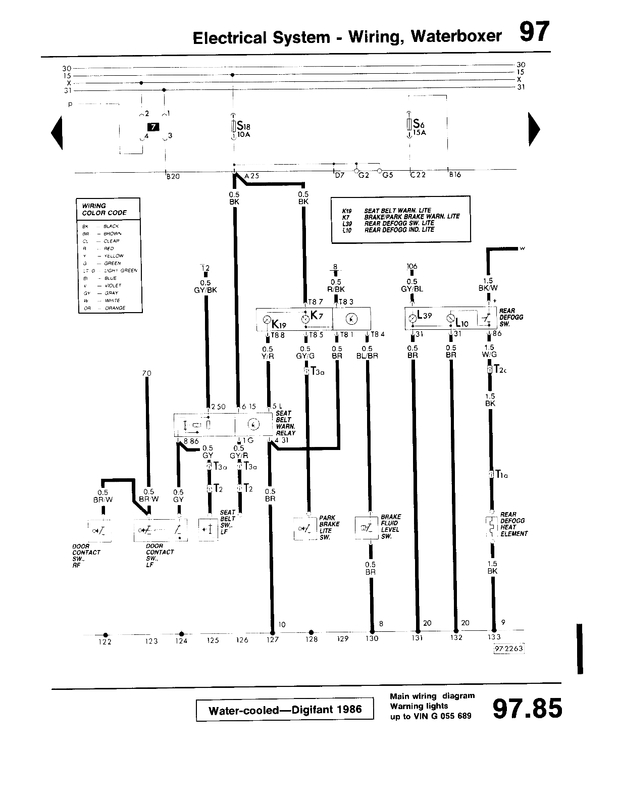 So that’s pretty well it, get the female spades of both the grey door switch wire and the new wire to G9 in the relay socket so that the grey wire goes to 86, and the newly installed wire goes to 85. When installed, the obnoxious chime will sing out whenever driver’s door is opened and the lights are on. Pics below illustrate somewhat, see the incomplete wiring to the seat belt warning relay socket? Only a grey, a grey/black, and the double brown ground are installed. Edit 29/05/2010: had pics of wrong relay. 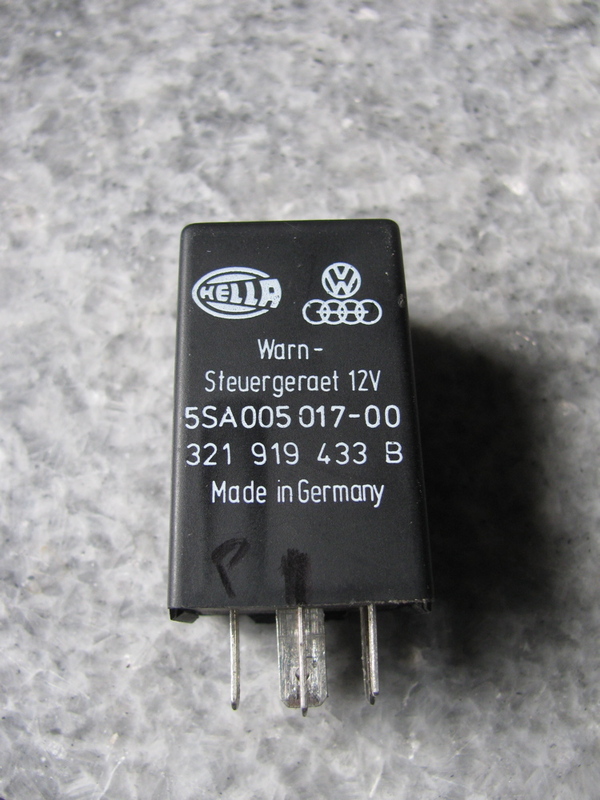 Of course its not a “99” relay, the “99” relay is the programmable intermittent wiper relay. Proper relay pics inserted.